The idea behind this date night is simple.... it's the details that will take some work. The Idea: Make your own Melting Pot Restaurant. Eating there is very expensive. When recreating at home, it can be done very cheaply! "I'm so "fondue" of you...join me this evening for a romantic fondue for two." "You make me melt...join me this evening for a romantic fondue for two." "If your love for me is true, then join me for fondue..."
I like to have three options, but you can simplify or expand depending on your preference. There are SO many different recipes. I'll leave that up to you. Google it. Oil/Broth Fondue - Dipping foods: meatballs, prepare cubed meats, shrimp, scallops, vegetables, potato chunks, mozzarella sticks, (cocktail, horseradish and teriyaki sauces for dipping). Feed Each Other - (with the skewer, your fingers...or, your mouth...) ooh..this could get a little seductive! Take turns blindfolding each other while feeding each other... Create suspense when possible. Desiree, one of my readers, submitted this photo of the Fondue Night she put together for her hubby. Thanks, Desiree! If you have a "Fondue Night" photo to submit, please email to ccloveactually AT gmail DOT com. Ha ha! I did get a fondue pot for my wedding and I haven't used it the whole 10 years. What a shame! This does look like a really fun night. I could get into this! Thanks for the cute ideas! Cute idea! I love The Melting Pot! LOL! Fondue of you. Romance is cheesy isn't it? I love it. Hubs and I get cheesy all the time, his co workers often look at him strangely when I've left him romance in his lunch box, but he adores it. Oh that looks and sounds so tasty!! What a great idea. Stopping by from SITS to say hi! Cher, I love this idea & can't wait to try it! Great ideas! 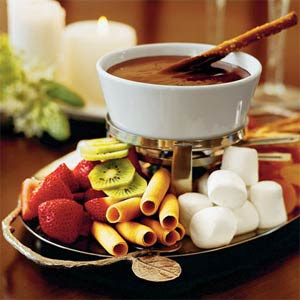 I think I'll have to do a fondue night very soon! Fabulous idea--I can't wait to do this date! Tonight we are doing your idea of "romantic picnic at the park"! Thank you for this blog-- I NEEDED help with ideas, thank you for being my answer:)! Yummo! I love fondue! We used to have a fondue pot, but I'm not sure where it is exactly...hhmm. gosh the melting pot is so darn expensive so this could be good! perhaps I shall put a pot on my gift registry for next year :) Thanks Cher for sharing! My husband's birthday is in two days and I've had NO IDEAS on what to do for him. We do have one of these makers and I think I will use it with some cheeses and other spreads. Thanks for the ideas! I'm so glad I found your site through some blog hopping I did. I love it and believe it's important to keep the love and romance alive and well! Thank you for all of you wondferful ideas, I think I have them all pinned on Pinterest!